With another week of NFL action behind us, and more new data points to analyze and consider, I’m here to help you with your toughest Week 3 start/sit decisions. 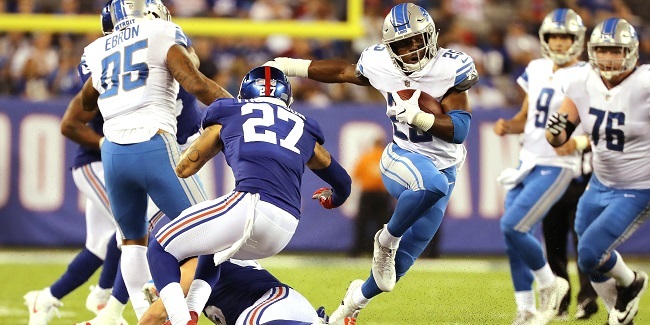 Theo Riddick, RB, Detroit Lions (vs. Atlanta) – If in a PPR league, Riddick is a strong start in his (arguably) best matchup of the season. Last regular season, the Atlanta Falcons allowed the most receiving fantasy points per game (14.5) to opposing running backs. In the postseason, running back James White recorded 31 receiving fantasy points against the Falcons to help lead his team to a Super Bowl victory. In Week 1, the Falcons allowed 23.1 receiving fantasy points to Jordan Howard and Tarik Cohen, and could have given up even more had Howard not dropped an end-zone target. Last week, Ty Montgomery gashed the Falcons for six catches on seven targets for 75 yards and a score. Riddick is tied for second on the team in targets with 10. If you’re not starting him this week, I’m not sure when you would (outside of as a bye-week replacement). LeSean McCoy, RB, Buffalo Bills (vs. Denver) – To the detriment of many of my DFS lineups, I went nearly all-in on Ezekiel Elliott last week. My reasoning was Denver was a “reverse-funnel” defense last season, allowing the third-most rushing attempts per game (30.1) and the fifth-most rushing yards per game (130.3). This of course, didn’t work out very well for me after Elliott totaled just eight yards on nine carries. Buffalo has been the league’s fourth-most run-heavy offense this season, and McCoy ranks seventh in carries and fourth in targets, despite pulling himself off the field at times with various minor injuries. The matchup looks tougher on paper this season, with Denver grading out as our top run defense this year, but at the very least, McCoy should be held afloat on volume alone. Christian McCaffrey, RB, Carolina Panthers (vs. New Orleans) – McCaffrey has struggled in efficiency, but has served in a more attractive role than I would have imagined – ranking 13th-best among running backs in expected fantasy points per game. I’m betting McCaffrey gets back on track this week against a New Orleans Saints defense that allowed the third-most receiving fantasy points to running backs last season. J.J. Nelson, WR, Arizona Cardinals (vs. Dallas) – Last week, Nelson saw two red-zone targets, ranked fifth in yards in air, and fifth in expected fantasy points. The Cardinals were without John Brown, Jermaine Gresham, and David Johnson in Week 2. These three players account for over 35 percent of Carson Palmer‘s targets and yardage over the past three seasons. We know Bruce Arians targets his WR2s and WR3s at one of the highest rates in the league. Gresham likely returns in Week 3, but Nelson should remain a flex-worthy start so long as Brown remains out of the lineup. Through two weeks, Larry Fitzgerald ranks sixth in targets (19), third in red-zone targets (four), and third in end-zone targets (three), but has been woefully inefficient, catching just nine for 95 yards and no scores. You’re likely starting him as well, and hoping his production catches up to his volume. Mike Gillislee, RB, New England Patriots (vs. Houston) – Over LeGarrette Blount‘s New England career, he’s averaged over a touchdown per game and 14.5 fantasy points per game when New England has won by a touchdown or more. Including plays called back due to penalty, Gillislee has dominated 10 of the Patriot’s 12 fourth-quarter carries. Like Blount in 2016, he leads the league in opportunities inside the 5-, 10-, and 20-yard lines. This seems like the perfect opportunity for Gillislee to rack up touchdowns and play the closer role in a game the Patriots are favored by 13.5 points. Chris Carson, RB, Seattle Seahawks (at Tennessee) – Through two weeks, Carson leads all Seattle running backs in yards from scrimmage with 149. The next-closest running back on the team – C.J. Prosise – has only 33. Eddie Lacy was a healthy scratch Sunday, while Thomas Rawls gained only two yards on six carries. Carson, meanwhile, had 20 carries for 96 yards, and was our fourth-highest-graded running back (via the run) for the week. It’s still early but it appears safe to presume Carson has locked up the role of primary early-down ball-carrier for the league’s most run-heavy offensive play-caller. Jacquizz Rodgers, RB, Tampa Bay Buccaneers (at Minnesota) – In eight games over the past two seasons, Rodgers averages 17.1 carries per game when Doug Martin missed time. Rodgers draws a tough matchup against the Vikings, but with Sam Bradford either hobbled or out, I like his chances of racking up carries and scoring opportunities against an offense that totaled just 237 yards and nine points in Week 2. Tarik Cohen, RB, Chicago Bears (vs. Pittsburgh) – Through two weeks, Cohen ranks fifth-best among running backs in expected fantasy points per game. He ranks fifth among all pass-catchers in targets with 20, and should continue to see a high target share given Chicago’s horrifically poor wide receiving corps. As Evan Silva has already astutely pointed out, Jordan Howard led all running backs in drops last season, dropped a game-winning touchdown in Week 1, and in his next (and only) target in Week 2, dropped that as well. He’s unlikely to see much more work in the passing game moving forward. Howard was hurt leading up to Week 2 and was seen with his arm in a sling after Sunday’s game. Pittsburgh ranked bottom-five in receiving fantasy points allowed to opposing running backs last season. Even if Howard plays in Week 3, Cohen feels like a safe bet to outscore him. I’m benching Howard this week if I can help it. A.J. Green, WR, Cincinnati Bengals (at Green Bay) – I’m a big believer in the old adage that “the squeaky wheel gets the grease,” but especially so after an offensive coordinator was fired the following day after Green called for more targets. Green is a must-start against what’s, at the very least, a bottom-three secondary in the league. Julio Jones racked up 95 yards on seven targets in the first half, and could have had a monster game had the team not passed the ball just eight times in the second half. The Bengals should be trailing and passing both early and often against the high-powered Packers offense this week. I saw his name mentioned several times on twitter this week, but to me, he’s an easy must-start. Isaiah Crowell, RB, Cleveland Browns (at Indianapolis) – Like with Green, Crowell called for more carries following Week 2’s lost to the Ravens. He should get it this week in, potentially, the only game he’ll have all year running behind positive gamescript. Cleveland is favored by a point on the road against the Colts, after facing two tough matchups against Pittsburgh and Baltimore. Crowell gets the Jets in two weeks, but outside of that, if you’re not starting him this week, I don’t know when you will. Marqise Lee, WR, Jacksonville Jaguars (vs. Baltimore in London) – Lee ranks 14th among wide receivers in targets with 15. Lee will have to suffer through poor quarterback play throughout the season, but will serve as the team’s WR1 for at least as long as Dede Westbrook remains on IR. The Jaguars are now a run-first offense, but Leonard Fournette and company could struggle against a Ravens defense that allowed the fourth-fewest rushing fantasy points per carry to opposing running backs last season. Lee is worth a start in deeper leagues this week. Rashard Higgins, WR, Cleveland Browns (at Indianapolis) – Higgins was our ninth-highest-graded wide receiver coming out of college in 2015, but saw just 12 targets in 2016. With Corey Coleman on IR due to a broken hand, and Kenny Britt currently ranking as our worst-graded wide receiver via the pass this year, Higgins should continue to serve a massive role going forward. He saw 11 targets in Week 2 (sixth-most), even exiting the game in the early third quarter. It might be worth benching Higgins and waiting another week to make sure his role is secured, but he’s still a strong start if desperate. C.J. Anderson, RB, Denver Broncos (at Buffalo) – Through two weeks, Anderson ranks as our second-highest-graded running back, first in touches, and tied for first in red-zone opportunities. He faces a Buffalo defense that surrendered the third-most rushing fantasy points per game to opposing running backs last season. He’s an every-week must-start going forward. Javorius Allen, RB, Baltimore Ravens (vs. Jacksonville in London) –Allen played on 63 percent of Ravens’ snaps on Sunday, after seeing 50 percent of the snaps in Week 1. In Week 2, Allen led the Ravens in carries and saw 71 percent of the team’s running back targets. With left guard Marshal Yanda (our top-graded guard in each of the last three seasons) now out for the year, this could hurt the efficacy of the running game and offense as a whole, or it could help further cement Allen’s place as the team’s primary running back. With a less effective offensive line, the Ravens will need a running back they can trust in pass-blocking (his role 74 percent of the time), and one who can help alleviate pressure by going out for short passes (leads Ravens running backs with 21 routes, 12 more than next-closest). Allen saw 62 targets in 2014 (his rookie season) and seems far and away the most complete back on the roster – at least until the possible (but by no means guaranteed) return of Danny Woodhead. Terrance West is banged up with a thigh injury, and did not practice on Wednesday. Alex Collins could steal some work, but Allen looks like a strong play this week in what should (at least) be a close game against the Jaguars. Davante Adams, WR/ Martellus Bennett, TE, Green Bay Packers (vs. Cincinnati) – With Randall Cobb and Jordy Nelson either out or limited for Week 3, both Adams and Bennett become strong starts. Both players saw double-digit targets last week. Bennett ranks third among tight ends in routes run per game and third in targets with 15. Adams drew a tough matchup in Week 1 against Richard Sherman, and could see a good amount of Adam Jones (who ranks top-five in fantasy points allowed per route in coverage over the past three seasons), but volume should be enough to make him a strong play. Despite the injuries, Vegas still has Green Bay with the fourth-highest implied point total of the week. Cole Beasley, WR, Dallas Cowboys (at Arizona) – If in a deep PPR league, Beasley is worth a look in the flex. He faced our top-two-graded slot cornerbacks in Dominique Rodgers-Cromartie and Chris Harris Jr. in Weeks 1 and 2. Dez Bryant draws a brutal matchup against elite shadow cornerback Patrick Peterson who ranks best in fantasy points allowed per route in coverage over the past three seasons. Jason Witten draws a tough matchup against a Cardinals defense that allowed the fewest fantasy points per game to opposing tight ends last season. Meanwhile, through two weeks, Arizona has surrendered the most targets (23) to wide receivers out of the slot, and I can certainly see that trend continuing this week. Martavis Bryant, WR, Pittsburgh Steelers (at Chicago) – Easily my worst call of last week was telling you to bench Bryant, based on a perceived tough matchup and poor production during the preseason and Week 1. Since last season, I’ve ranted about how Chicago has done a good job of stopping WR1s, despite poor cornerback-play, running cover-six at the highest rate in the league. I was careful not to bring this up last week when mentioning Mike Evans, and with linebacker Jerrell Freeman out. This would have made Bryant the superior matchup play over Antonio Brown, but I’m no longer convinced Chicago has the personnel to stop Brown. Still, Bryant is likely an every-week must-start, though he’s likely going to be a streaky play on a week-to-week basis. Streaming defenses – If streaming defenses this week, I’d look to target heavily favored teams up against offenses with a porous offensive line. The Eagles, Titans, Dolphins, Packers, and Steelers all come to mind. 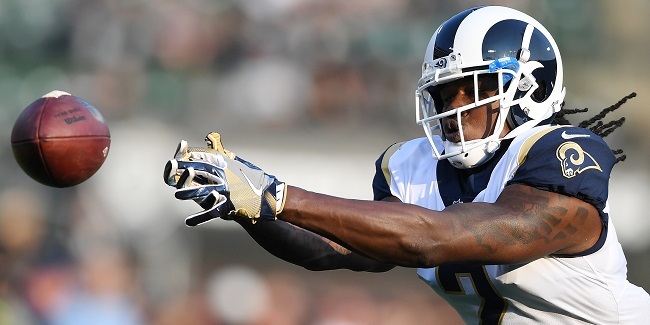 Sammy Watkins, WR, Los Angeles Rams (at San Francisco) – Through two weeks, Watkins ranks just fourth on the team in targets with seven. Rookie Cooper Kupp again draws the more favorable matchup this week. 49ers slot cornerback K’Waun Williams has allowed 13 targets while in the slot, which ranks highest in the league. I’m keeping Watkins on my bench until further notice. Tyler Eifert, TE, Cincinnati Bengals (at Green Bay) – I’m high on A.J. Green this week, but am off everyone else on the Bengals this week. The offense looks atrocious, ranking last in total points and eighth-worst in total yards. Eifert has caught just four passes for 46 yards and did not practice on Wednesday dealing with knee and back injuries. You’re not cutting Eifert, but you’re also certainly not starting him this week. Eifert is too heavily reliant on touchdown scoring, and offers little upside in games Cincinnati is not expected to win or rack up points. As 8.5-point underdogs with the second-lowest implied total of the week, Eifert is an easy fade. Stefon Diggs, WR/Adam Thielen, WR/Kyle Rudolph, TE, Minnesota Vikings (vs. Tampa Bay) – In Case Keenum‘s last four games, he’s averaged just 230 yards, 0.5 touchdowns, and 1.25 interceptions per game. No receiver saw more than six targets in an offense that tends to spread the ball around. The matchup isn’t terrible, but I’m avoiding these players in Week 3 if Sam Bradford sits. Russell Wilson, QB, Seattle Seahawks (at Tennessee) – Last season, Tennessee was the league’s most blitz-heavy defense and led in pressures per game. Last week, Wilson was pressured 21 times, or 46.7 percent of his dropbacks against the San Francisco 49ers. This was the most pressures recorded by San Francisco since 2014, who ranked tied for sixth-worst in pressures per game last season. The team recorded just six pressures on Carolina in Week 1. With Reuben Foster out in Week 2, San Francisco was likely fielding a bottom-five front-seven, and yet, Wilson couldn’t do anything behind his offensive line. I’m not optimistic for Wilson in Week 2, and feel it’s time to start exploring other alternatives. DeMarco Murray, RB, Tennessee Titans (vs. Seattle) – Derrick Henry out-touched Murray 14 to 10 in Week 2. Through two weeks, he leads Murray in yards per carry 5.9 to 3.3. Murray, our third-worst-graded running back this season, is clearly not right, dealing with a hamstring injury. He failed to practice on Wednesday and is in a tough matchup against a Seahawks defense that ranked second-best in yards per carry allowed last season. I’m benching him if I can help it. Dez Bryant, WR, Dallas Cowboys (at Arizona) – Bryant currently ranks second among all receivers in targets (23), fifth in yards in the air (276), and first in end-zone targets (7). In spite of this, he ranks just 19th in fantasy points with 25.2. To me, the volume is encouraging, while the lack of efficiency isn’t surprising at all. As I wrote about this offseason, Bryant has been the league’s most “cornerback-sensitive” wide receiver over the past three seasons. So far, Bryant has run 66 of 105 routes lined up against the following cornerbacks (all graded top-seven in coverage last season): Dominique Rodgers-Cromartie, Janoris Jenkins, Aqib Talib, and Chris Harris Jr. Unfortunately for Bryant, it doesn’t get any easier next weekend. Against the Cardinals, he’s likely to be shadowed by Patrick Peterson, who, over the past three seasons, ranks best among all cornerbacks in fantasy points allowed per route in coverage. The last time these two faced off, Peterson lined up across from Bryant on 35 of his routes, holding him to just two catches on 10 targets for 15 yards and a score. If starting Bryant this week, you’re probably just praying for a score – though I’d try to bench him if I felt deep at the position.